The shock of the news of his death will be forever carved in my memory. I heard it from one of my least favorite sources, Fox News. I was taking care of my elderly parents who insisted on having the conservative channel on, and the breaking bulletin interrupted their regular programming. Robin Williams was dead. I had been filtering out the misinformation from the channel for the previous hour, but this report, sadly, had a ring of credibility. I jumped onto social media and announced it to my immediate base of followers. There was some push back as Williams had been the victim of previous hoax death announcements before. As more news sources picked up the story, it was confirmed. The unthinkable was true. Fox News went on to more disrespectful commentary of Williams, but I was too overcome to deal with small mindedness. My instant grief over this celebrity was profound, but it took me a while to process and get some clarity as to why. Certainly, he was a man of incredible talent and accomplishment. He was a cultural icon and it is unfathomable to imagine the creative landscape without him. There was a deeper profound loss in the news for me, however, something very personal, and it took a night of sleep for me to fully get a sense as to what it is. I am a dad. It is the part of my being with which I identify first and most strongly. As I awoke this morning, the first morning of a Robin Williams-less world, I felt a loss in the definition of what it is to be a dad. The icon depicting the spirit of the modern dad is gone. The tapestry of Robin Williams characters had given me the rich definition of what it took. His enormous resume had everything on it, from alien to robot, to mythical genie, but , unlike any other artist, the golden chord running throughout was a comment on what was required to be a dad. Titles of his lesser known movies “Fathers Day” and “The World’s Greatest Dad” seem to underscore the point. In the decades before Williams we had the Spencer Tracey style dads who ruled homes from a detached but lovable distance. We had the hero dad in To Kill A Mockingbird with Gregory Peck’s Atticus Finch. In television we had Ozzie Nelson and fathers knowing best, culminating into the first significant depiction of all dad parenting in Fred MacMurray’s My Three Sons. Fred MacMurray’s father image also carried into films such as the Flubber movies, and fittingly, Robin Williams was the modern heir who stepped into the Flubber dad shoes. 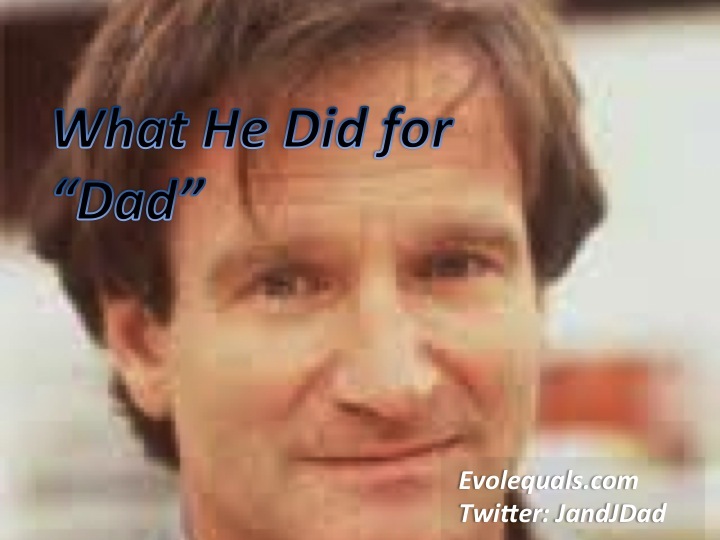 My first recollection of Robin Williams as a dad was in The World According to Garp. It was in this first venture in which he depicted the true complexity of modern fatherhood. Garp was a dedicated dad, but he was tragically imperfect. He had failure, guilt and resurrection. His story was strange and atypical, yet the spirit of what many good men, and good fathers felt was true. Even monumental roles where Williams did not literally play a father still spoke unflinchingly to the behavior of fathering. From Aladdin to Good Will Hunting, Williams embodied the influential fathering figure inspiring a young man to be himself. In Dead Poets Society, he inspired boys whose actual fathers had emotionally abandoned them. William’s character taught them to not only “seize the day” but to look at life from different angles. It was this concept, of not being constrained by predetermined limitations, that infused itself into what was, in my opinion, William’s most significant redefinition of fatherhood. His dad characters never stayed in their limited boxes, but broke free, challenged perceptions and grew. Robin Williams was the most visible gay dad in cinema history to date. In The Bird Cage, he took a role that had been played by others in French cinema and on stage. He brought it the widest visibility in popular culture. In the film, his character navigates a very human fathering path with his son, one which speaks to me as a gay man raising my own sons. It is a path where “being there” for his son seems to include denying his own identity. From boy scouts to introductions to my sons’ newest best buds’ families, that path is all too familiar. Williams taught me how to bring life’s audience to the realization that being gay and being a father are far from mutually exclusive propositions. Williams most compelling impact on the true nature of modern fatherhood was not as a theatrical gay dad however. It was also not as the dad who searches for his children in the afterlife, or as the dad who is a grown up Peter Pan, choosing fatherhood over the ability to remain a little boy forever. Those held additional insights to the modern dad, but not the greatest. Williams most profound impact as a dad was when he donned a skirt, a fat suit and bifocals. It was not that he became Mrs. Doubtfire, it was that he was a divorced dad willing to become Mrs. Doubtfire. The Williams portrayal of Doubtfire said more about a man’s ability to break free of conventional wisdom and be a full nurturing parent than Sally Field’s Norma Ray said about women being union leaders. The cultural persona Robin Williams brought to modern fatherhood was not the guy with all the answers, and the demand for authority. He was the all human guy who was learning to release his boyhood, and throw his full intentions to the well being of his kids, for whom he would make any sacrifice. His characters loved their kids beyond anything else. They trashed their own egos and identities for the sake of their kids and in the process evolved into better men. Modern dads have learned – – – we have a lot to fight, but if we stay focused on that love for our kids, we’ll be better men. This, for me, is the heroic contribution of Robin Williams. He was the imperfect dad, but the dad who would do anything to get it right. He was my cultural role model dad, and what he depicted is what I have grown up to be. He earned respect while never pretending that he was anything more than human. Dear Mr. Williams, I am a stranger to your real life and the demons you could not overcome. I mourn you, and I will miss you for what you contributed to me in my life, nonetheless. This entry was posted in Entertainment, Family, Living. Bookmark the permalink. What a wonderful perspective you bring! Mr. Williams ….. there are many out there saying Thank you!! So thoughtful and beautiful, Rob. Thank you for expressing these thought for so many.